Tyler Green talks to painter Sedrick Huckaby about his work. 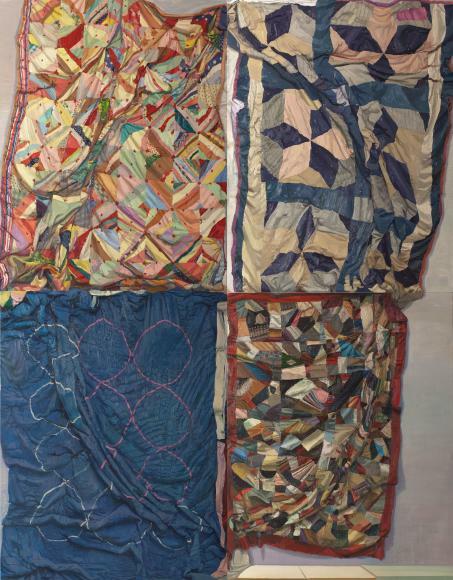 Huckaby's large painting - Hidden in Plain Site (2011) - is on view at the Amon Carter Museum, Fort Worth through February 2, 2014. Huckaby comments: "There's always a thought about how deep does a picture go - and obviously many of them it's almost zero space. It's as if sometimes the quilt was literally painted on the surface and because the paint is thick it bends where the actual quilt would bend. At that point there's a literal dialogue between painting and relief... Sometimes when I use thick paint, it's just thick paint - I'm just swimming in the paint, I'm loving it - but sometimes when I'm painting form ... paint protrudes forward, or out, or gets thick where the actual object would come out towards the viewer, and it gets thinner as it goes back into space. So, literally sometimes I think of it like a relief... One of the things that happens in relief is that there's literal form but it's slightly compressed. And even in the literal form there's a suggestion that it's deeper, that there's more depth than you're actually seeing... the only difference is that with painted space, the color is allowed to go into that conversation. The color also helps to dictate space."